Diloreto Elementary & Middle School in New Britain, one of the state’s lowest-performing schools. At least two-thirds of black and Hispanic students in Connecticut are behind in math or English – percentages that have not budged over the last four years despite various state education reform efforts during that time. Students from low-income families had similar dismal results. And most of these students are not even close to catching up, with about 40 percent significantly behind. Meanwhile, white students and those from middle- and high-income families reached grade-level at twice the rate of their peers. Curious how your school and district did? Click here to find out. All this means that the yawning gaps in achievement between these historically low-performing students and their classmates have remained virtually unchanged over the last four school years. It is not possible to compare further back than the 2014-15 school year since Connecticut public school students took a different test prior to that time. However, huge gaps existed on those statewide tests, as well. Connecticut has for years had among the largest gaps in achievement in the nation between students from low-income families and their better-off classmates. And scores on that national test have remained steady, as well. On the state test released Thursday, there was, however, a marginal one-year increase in the rate of students reaching grade-level, which state officials expressed optimism about. Students from low-income families saw the largest increase, with about 3 percent more of those tested reaching grade level in math and English. That was the same rate increase students not from poor families achieved, as well. The state has rolled out several reforms since the 2012-13 school year, including tying increased state education aid to new reforms district leaders promised to make. Several superintendents in the state’s lowest-performing districts, however, testified in 2016 during a school-funding trial that the additional money sent to the the 30 lowest-performing districts – $140 million more during that school year compared to six years earlier – overwhelmingly went to cover their districts’ growing expenses and not new initiatives or increased services. 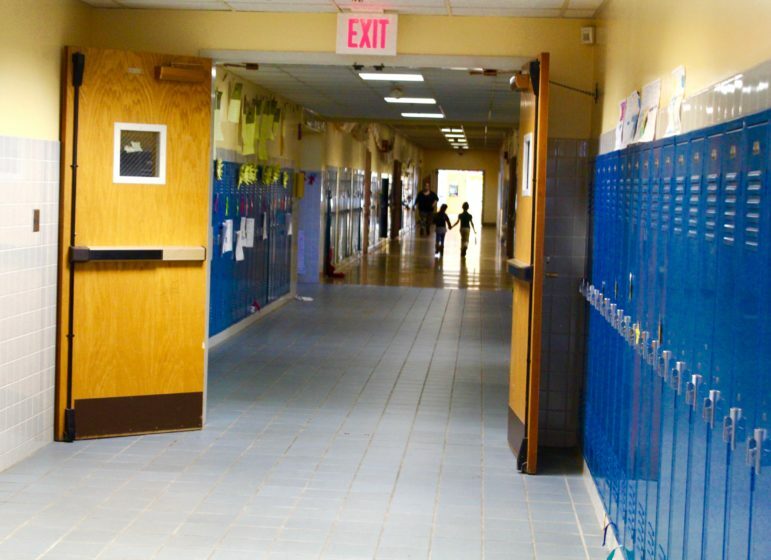 Further, experts from the University of Connecticut’s Neag School of Education last year found the state’s strategy for improving struggling districts was in need of some coherence. Test results released Thursday show that the rates of students reaching grade level in those 30 lowest-performing districts – dubbed Alliance Districts – were largely unchanged over the last four years. Among the state’s 10 lowest-performing districts, Windham saw the largest gains with almost seven percent more students tested reaching grade level in English compared to four years ago. 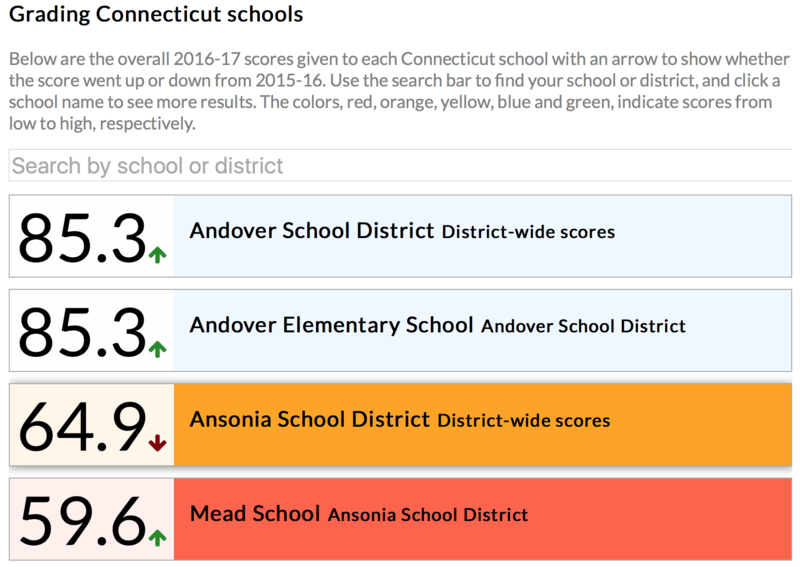 Two districts – Hartford and New Britain – saw a smaller rate of students reaching grade level compared to 2014-15. Math results were a bit more promising, with districts seeing somewhat larger gains. Meriden saw the biggest increase, with nearly 17 percent more students reaching grade level. Educators and advocates have long expressed concern with the snail’s pace of bringing more students up to grade level, and have pointed out that at the current trajectory it would take a decade to even get half of the students from low-income families to grade level. This year, about 3 percent more students reached grade level in math and English. Asked if the slow pace signals the state is in need of a new approach for improving struggling schools, Gopalakrishnan declined to elaborate except to say that the state education department is pleased with the upticks, and that work remains. Looking at pass/fail rates alone doesn’t tell the whole story. Each year, the state sets targets for what a student should learn from year-to-year, regardless of how far behind or ahead they are in school. For students significantly behind, if they reached the targets set for them, then they would typically reach grade level within five school years. Results released Thursday show that in English, the average percentage of target achieved was between 56 and 68 percent, depending on the grade. In math, the percentage of target achieved was between 56 and 70 percent. However, the state has moved in the wrong direction when comparing how much of the target is being reached over a four-year period. State officials were quick to remind reporters when releasing the test results this week that there is much more that determines whether a state’s public education system is heading in the right direction. Want other ways to measure how Connecticut is doing? Here are some links to find out teacher ratios, chronic absentee rates, school discipline occurrences or a myriad of other facts about your school.